Ring of Brodgari is one of the most precious ancient monuments, you might see today in Scotland. In essence, Ring of Brodgari is a megalith facility similar to dolmens and menhir, for religious use. Represents a number of prehistoric stone structures arranged in a circle. Ring of Brodgari is situated on the largest of the Orkney Islands-Mainland. Orkney is an island group, which includes about 70 small islands scattered on just 100 sq km area. Ring of Brodgari is dated from the era of the late Neolithic or Bronze Age. This ancient testimony about the culture of Scottish land is built on a narrow isthmus between the lakes Stenness and Harray. Most likely it was built between 2500 BC and 2000 BC, but its exact age is not calculated. 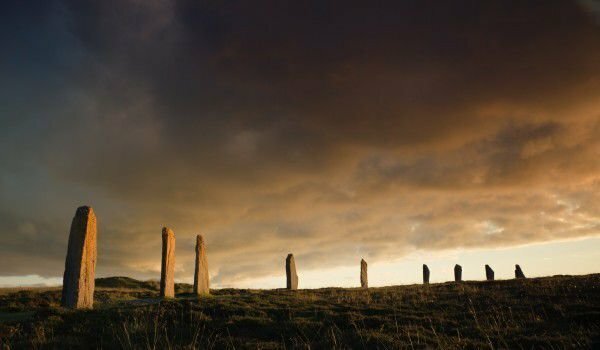 Today, The Ring of Brodgari is often called The Heart of Neolithic Orkney, this ancient temple is included in the UNESCO list of world cultural heritage sites. This stone circle is in the center of a large valley surrounded by hills and beautiful views of lakes . By the time the complex was constructed, thousands of years ago, this lake was not here, but rather a vast marshy lands. Ring of Brodgari is composed of stone blocks that resemble circles or oval shape with a diameter of 20 meters. The entire stone is approximately 104 meters wide. It is assumed that once was composed of 60 megalithic blocks, of which today are only 27. This historic landmark reminds Fossil Forest in Stenes, with the difference that the Ring of Brodgari blocks are much smaller. Their height varies from 2.1 m to a maximum of 4.7 meters. With its size, the old sanctuary is considered the third largest stone circle in Britain. Ring of Brodgari extends a total area of 8 435 square meters, making it ahead of only the stone circles at Avebury and large ring of Stanton Drew in England. Under the assumptions of scientists Ring of Brodgari was probably part of a huge prehistoric, ritual complex, to which have been assigned the Fossil Forest of Stennes, and possibly ring of beech. Once it was called Temple of the Sun. Excavations at the sanctuary are disclosed as ceremonial buildings and residential. Among the artifacts that emerge into the world in archaeological activities are one stone head, mace, other pottery and bones. Undoubtedly one of the most significant discoveries of historians remain the ruins of a large stone wall which was about 100 meters long and about 6 meters wide. It is believed that it was a symbolic barrier between the ritual space of the Ring of Brodgari and the earthly world, beyond its outlines. One of the researchers who made excavations to the wall as possible people from all over the place, which is now known as Kesteven, have come here to regulate marriage, or to exchange animals.